The project develops the theme of Laughter: the most direct, easy and universal tool we own to transmit positive vibrations to the outside and transform our psychophysical mood into optimal well-being. Nowadays, scientific research have demonstrated the health benefits of laughter. It helps to get rid of negative energy, and it's also one of the most efficient means of communication between humans. Laughter therapy is a kind of treatment that show most of the powerful benefits of laughing. I organised a special session that mingled laughter therapy with the help of two instructors and photography, involving a mixed group of people from different countries. During the two hours workshop, the participants/models were given the chance to experience the immediate pleasure and benefits of laughter, its releasing power and its characteristic generation of happiness. https://vimeo.com/123312550 password: Exhibit-it “Crack up” is a series of guffaws: it shows moments of happiness and vulnerability induced by viral laughter. A special Thanks for the Founder of Escuela de Desarrollo Humano: Enrique Aguilar Ferraz and the Director of Laughter Therapy workshop: Silvia Lopez Bech, www.escueladerisoterapia.com The trainers: Merche Rivas and Ana Tanna and the participants: Sara Flotats - www.sensimterapies.com, Alexandra Farbiarz Mas - www.coachconecta.com, Koldo Peñas, Alejandra Caballero, Bruno Miguel de Lima Monteiro, Massimo Fazio, Olga Mumbru Quirós, Nicolas Uséo, Maria Antonieta Canfield, Chiara O'Neill, Maurizio Caffi, Stefano Fristachi, Giovanni Cultrera, Fabrizio Paparello, Ciro Conte. I am really happy to this wonderful news. In particularly to create this image I spend 4hours in the stage to to harmonise and balance the elements and draw the set of light. This image is part of a series of image for the commissioned project to present the value of the Interior design retailers and furniture store Little House Cottage of Barcelona. The idea of the picture is to present the huge diversity and originality of objects the costumers can find in the shop. The purpose is a living room with a strong personality and a masculine arrangement. The composition of this image is a meticulous and careful selection of pieces of furniture in a harmonic and balanced distribution. An accurate lighting set benefits the warm atmosphere in the scene and the postproduction finalised the image. Today Dario Fo leave us to go to Franca Rame and create, play, act their wonderful talent and profoundness. Dario Fo born in a little village in my province of Varese in the north of Italy. He and his wife Franca Rame are my adoptive grandparents. They spend all their life to create, produce and show theatre. In 1997 Dario Fo won the Nobel Prize of Literature and it was incredible for a comedian as him to receive this high award. I remember a beautiful speech he made longtime ago in a library in Milan. He presented his new bookbut with his easy way of speech he drive all the audience in a other world full of color, music, heart. Every word are complete optimistic and positive. And when he was overtime he spoke about the reaction of Franca and you can see just a man full of passion for everything he live in his life. Dario act, work, produce, write, draw … until the end of his days.. He died 13 octubre 2016 at 90 years old. Know How to Live the Time that is Given You. Life give me the wonderful opportunity to smell, feel and live Caribbean in Guadaloupe Island (France). The gorgeous landscape and the strong connection with nature is a wonderful heal for an urban man like me. I just love the photographic project of Angelica Dass about skin color and ethnic identity. I am glad to invite all of you to the Inauguration of my Fine Art Photography Exposition "OBSERVAME /1" in Eurostars Monumental Hotel - 20 April 2016 Barcelona. I take a huge pleasure to create with Little House & Cottage the image of this historical Decoration and furniture shop of Barcelona. Very Happy and Thanks a lot Graphic Encounter Fine Art to choose me as Featured Artist for February 2016. With a big pleasure I am in this new project : Fonda Europa, the older Fonda concept of hospitality in Spain. Jerry Uelsmann is an American photographer born in 1934 and the forerunner of Photomontage in the 20th century in America. Jerry Uelsmann is a master printer, producing composite photographs with multiple negatives and extensive darkroom work. He uses up to a dozen enlargers at a time to produce his final images, and has a large archive of negatives that he has shot over the years. Uelsmann does not carry multiple attachments, but only one camera, "Most photographers carry many cameras with multiple attachments. Most photographers have one enlarger. I have half a dozen." When beginning to create one of his photomontages, he has a strong intuitive sense of what he's looking for, some strategy for how to find it, and an understanding that mistakes are inevitable and are part of the creative process. His process begins after a day of shooting. He returns to his work station in his home and covers a large drafting table with hundreds of proof sheets. He folds and overlaps various contact prints, explores the visual possibilities, then brings the options into his darkroom. He then sets his selected pieces into the large number of enlargers that he owns in his darkroom, and moves the photo paper progressively down the line, building up an image. Italians in Barcelona ejeje Niccolo Fabi-Max Gazzé-Me-Daniele Silvestri. I cover as a Media the World Cup of my favorite sport, Basketball.. I just live for 2 weeks crossing Spain (Bilbao-Barcelona-Madrid) a Master of Mind Set. The Director of this Masterclass is Coach K. (Mike Krzyzewski) from Team USA. Klay Thompson and I, Coach K and Klay Thompson during an Press Conference. Big and Loud Applause to the Hopper Meditations Series of Richard Tuschman. I really love it! Hopper Meditations is a personal photographic response to the work of the American painter, Edward Hopper. Tuschman has long admired the way Hopper's paintings, with an economy of means, are able to address the mysteries and complexities of the human condition. Placing one or two figures in humble, intimate settings, Hopper created quiet scenes that are psychologically compelling with open-ended narratives.To Tuschman, the lighting acts as another character, not only illuminating the form of the figures, but also echoing and evoking their inner lives. Obviously as he did in the last three decades, all the pictures are deep of this talent to create poetic photographic images. Today with the amazing Furious team .. I film and shoot Femi Kuti!! Happy year 2014!!! From Athens, Greece. Happy year 2014!!! I start it working in a wonderful project of investigation with my journalist friend Alvaro Guzman Bastida in this gorgeous country called Hellás. Like movies have Oscars, Photos have IPA. I was awarded Honorable Mention Award in Fine Art -Nudes category for the winning entry "Ma.de.Moi.'.Elle". The 2013 International Photography Awards received nearly 18,000 submissions from 104 country across the globe. I soo happy to share this success with my friend and amazing make-up artist Itziar Lorente. I participe to Swiss Photo'13, gathered 59 participants from 16 countries! I receive a nice email. 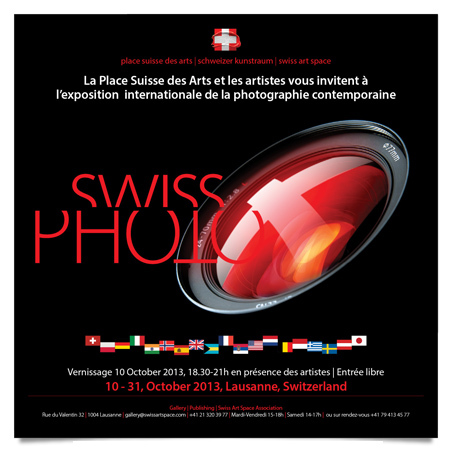 I have been approved to Swiss Photo 2013 artist call.